That amounts to about $1.91 ea which is really cheap for macarons. Apparently if you buy 9 you save even more. But I was horrified to find out that a single macaron costs $2.50 now instead of $2.30. That’s really really expensive! 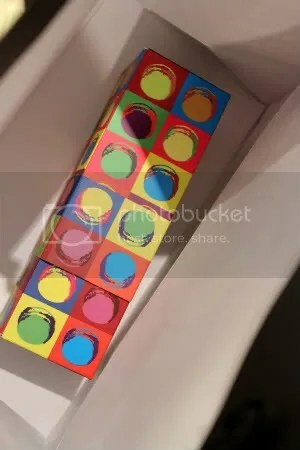 Another thing that changed was the box. 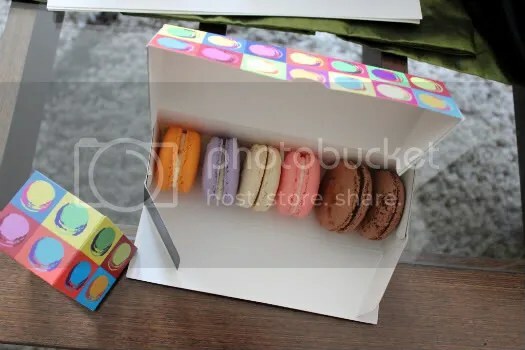 Gone is the black and pink checkered box and in its place is a chic macaron pop-art box (remember the legendary marilyn monroe?). The range of flavours are still the same… they need to come up with new ones to keep the craze going. Violet has a pleasant flowery aroma but my preference is still Rose for the stronger flavour. For the particular one I got, the crispy shell was a little too thick making it far too sweet. My advice is to have a nice pot of tea at hand! Caramel Sel didn’t leave much of an impression in the past for whatever reason. But now, I must say it’s one of my favourite flavours here because of the luscious sticky layer of caramel lightly spiked with just a tiny bit of fleur de sel. 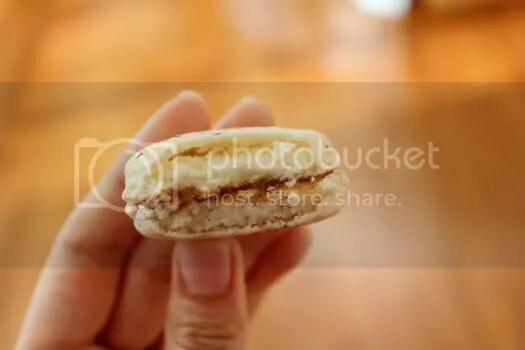 This particular macaron had a fantastic bite to it too- thin crisp shell and a cakey second layer. It’s surprisingly less sweet than the rest probably because of the addition of fleur de sel. What I really like about it is that the salty flavour is so subtle and mild but yet it makes all the difference. Visiting sweetspot and sky on 57 in 2 weeks (hopefully) for their macarons. Hopefully I’ll find new favourites on our tiny island!